From the west entrance of Yellowstone Park drive to Madison Junction take a left and drive to Beryl Springs area. Spring in Yellowstone, I had the privilege to watch this Grizzly sow trying to get her COY on the other side of the Gibbon River in Yellowstone. 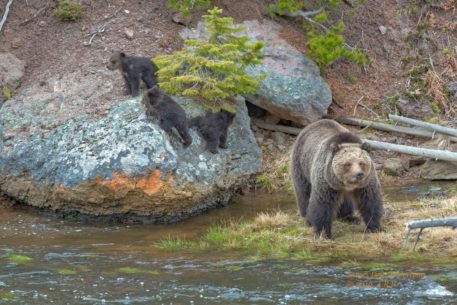 The Grizzly cubs wer no more the 4 to 5 months old and very small. It was a very trying time for all.